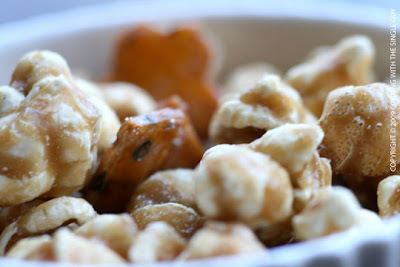 Any kid growing up in Hawaii will tell you about the trick of tossing Japanese rice crackers (mochi crackers with a soy sauce coating) with popcorn, getting your own special Hawaiian trail mix. 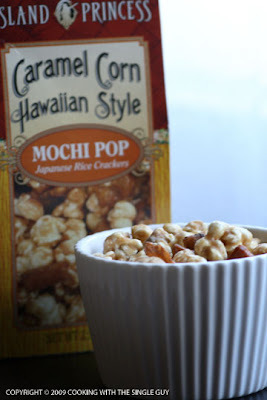 Anywho, recently my friend David went to Hawaii for a vacation, and he brought me back this box of treat called “Mochi Pop,” and it turns out it’s the childhood trick of mixing the rice crackers with popcorn, except they took it up a notch by mixing it with caramel popcorn instead of just plain popcorn. When I was wrapping up my post about my search for the best pisco sour drink in the Bay Area, I made one last stop at this Peruvian restaurant in Oakland because I figured where else would I find an authentic version of the national drink of Peru? 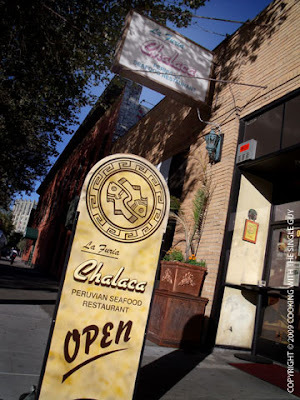 You can check out my post to see how La Furia Chalaca’s pisco sour ranked (sorry to say it wasn’t so authentic), but this post is all about the food at this tiny, almost divey seafood restaurant just north of Jack London Square. Opened for a few years, La Furia can be easily missed on Broadway, with most people probably heading to Soizic next door. And from the outside, you can’t really tell it’s a restaurant so it’s a good thing they had an “Open!” sandwich board in front. Unfortunately, in this quiet area of the neighborhood—which is seeing a rebirth with new condos and new restaurants opening—there are still a lot of street elements, like homeless people coming into the restaurant trying to ask for money. So these are some of the challenges La Furia faces, as well as for their diners. The room has quite an old world feel with the dark wooden furnishings. I sat at the bar, which didn’t have a bartender on duty, and surveyed the menu. 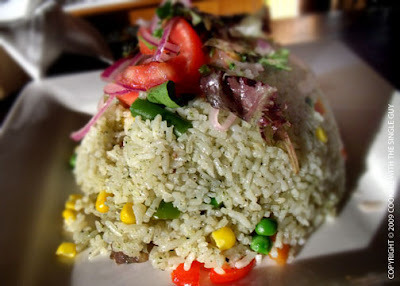 It offers up some interesting dishes, including Peruvian classics like ceviche, causa (mashed potato cakes) and lomo saltado (stir-fried beef, except they make it with chicken). There are also quite a few seafood options. I decided to start with the ceviche ($14), even though it was listed under the entrées, my server told me it was small enough to be a starter. 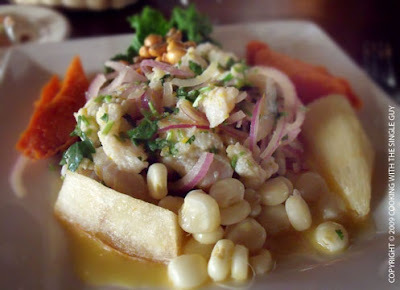 It arrived with all the classic Peruvian ceviche condiments, such as thinly sliced red onions, yucca, sweet potatoes and the corn-like kernels called choclo. The fish chunks marinated in lime juice was nicely balanced, not very tart. And I liked how they were in chunky pieces. There was a slight heat from the chili, but that’s what the sweet potatoes were for to soothe my mouth. I wasn’t a big fan of the yucca, but I liked that it was there to make it seem very authentic. For my main dish, I ordered something called Arroz con Pollo ($12) because of the description of a “whole chicken leg” served on rice. 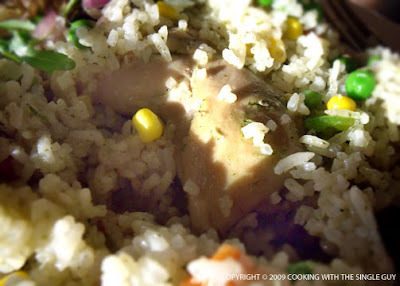 When the dish arrived, the chicken leg was buried under this mound of rice, speckled with peas and corn and some tomatoes. I ended my dinner with dessert, which was helado ($6)—the amazing South American ice cream that’s similar to gelato. 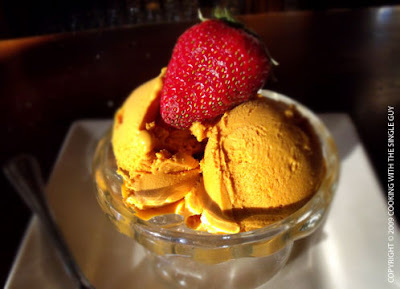 The flavor was lucuma, which is a popular fruit from Peru. The flavor and look is very similar to caramel, and this helado was super thick and creamy. I enjoyed it although I wished it was a bit colder. Overall, La Furia seems to offer you a nice glimpse at authentic Peruvian dishes, but in a simple presentation like you were visiting a friend’s home in Lima. 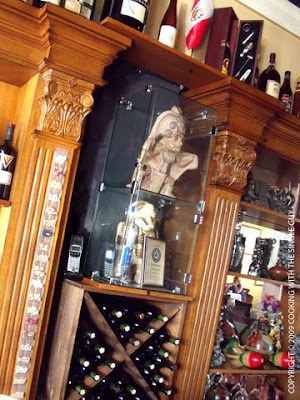 You won’t be amazed by the presentation but you’ll appreciate the informality. Hodo Soy is a testament to what one guy will do for good tofu. The fresh organic tofu products can be found under the bright yellow-and-white canopies at Bay Area farmers’ markets. 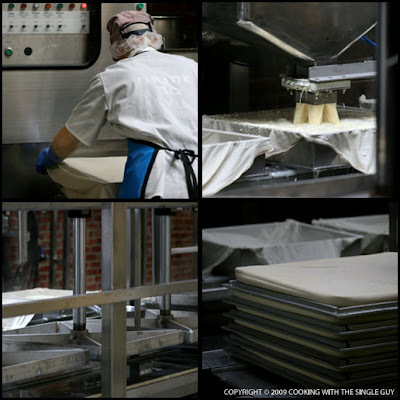 Since 2004, the small company has tried to cast tofu as a cool and tasty product in the Bay Area’s food scene; its workers offer up free samples or gladly spend time talking to you about the wonders of soy. The company was started by Minh Tsai, who grew up in Vietnam but came to the United States when he was 11. Working in finance, Tsai and his friends would get together for home-cooked meals, but often felt frustrated at the lack of good, fresh tofu like he remembered eating as a child in Vietnam. 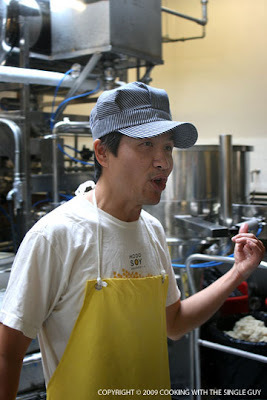 Long story short, he connected with some tofu-making relatives and Hodo Soy was born. 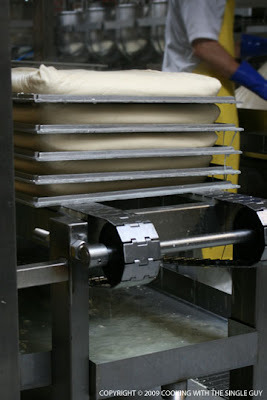 In just five years, Hodo Soy has established itself as a high-end organic tofu maker and this month opened a new 10,000-square-foot production plant in West Oakland. 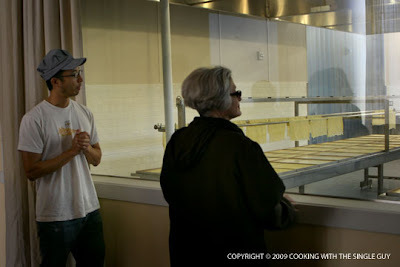 The new facility will be open to public tours in December to continue Hodo Soy’s mission of tofu education. Growing up Asian, I already understood the benefits and beauty of fresh tofu. So I jumped at the chance to go on a preview tour of the new plant to see first hand how beans turned into tofu. Here’s the founder Minh Tsai, who also has the title of tofu master. A charming and affable guy, Tsai explained how Hodo Soy uses dried soybeans from a supplier in the Midwest as the starting point for their tofu products. The soybeans are soaked overnight in filtered water and then ground into a pulp. 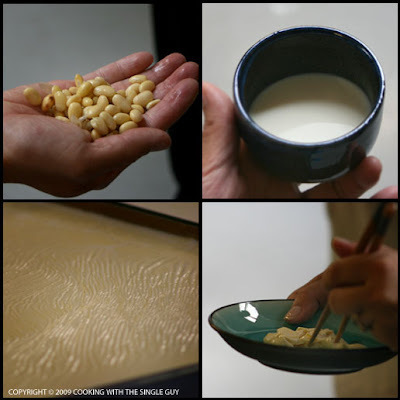 One of the first products extracted from the puree through a steam-injection process is the soymilk, which is the basis for the tofu Hodo Soy makes. We got to try a cup of fresh soymilk that was unsweetened. In its natural state, the milk had a nice nuttiness to it that gave it lots of body. We also tried fresh yuba, which is also known as “tofu skin” because it’s made by steaming the soymilk and pulling off the thin top layer, or skin, that forms. 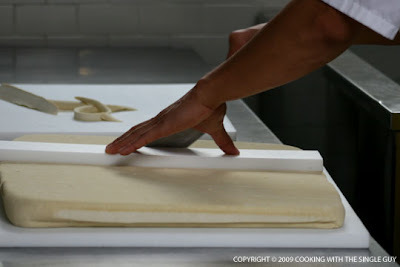 Fresh yuba is an expensive ingredient in Asia because of the labor involved in making it. Hodo Soy is the only U.S. manufacturer making and selling it fresh. (Most Asian stores sell it in dried form.) The yuba on this day was so fresh that we could still see the milk around the edges. Of course, when you buy the yuba at the farmers market stand, the yuba has been allowed to air out a bit and then sealed in its packaging. 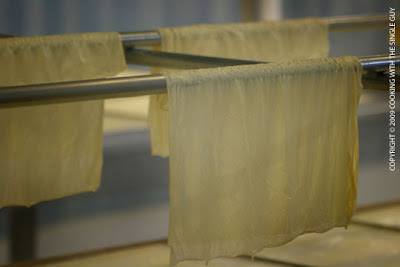 Here are the yuba sheets being drip dried at the plant. Hodo Soy’s yuba is served in such restaurants as Coi, Greens and The Slanted Door. 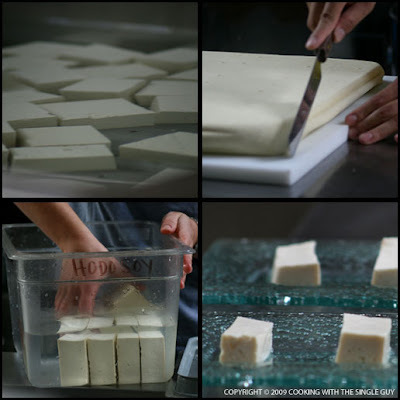 The tofu blocks are then cut up and stored in water so it can be sold at the farmers markets. Tsai says that all the employees who work at the plant also spend time at the farmers market selling the products. So you really do meet the people who make what you buy. 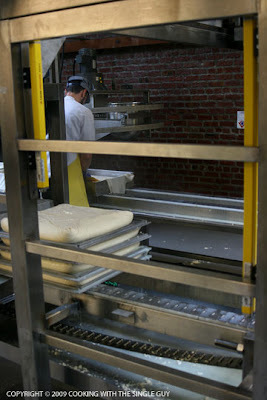 It also gives the workers a chance to hear feedback about their tofu. In the back of the plant is a kitchen, and it’s not just where the workers take their lunch break. 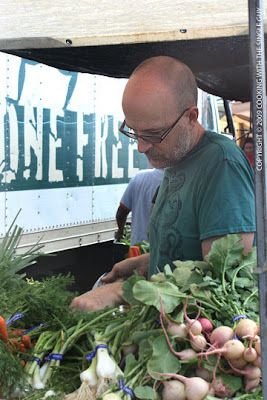 Hodo Soy has a chef who develops recipes and creates cooked products that are packaged and sold at the farmers market. At the end of the tour, we got to sample a table full of tofu dishes, including some sautéed tofu pockets, poached tofu, tofu croquettes and stir-fry tofu noodles. I especially liked the croquettes, which tasted surprisingly light and not at all dense. With this new and bigger plant, Hodo Soy can now extend its reach beyond the farmers markets. But because Tsai and his team are so focused on quality and freshness, they’re carefully negotiating with retailers and distributors, working out issues such as shelf life, etc. 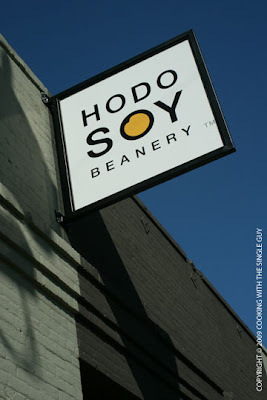 For now, Hodo Soy can be found at Rainbow Grocery and possibly down the road at the Berkeley Bowl. If you’re interested in tofu and want to talk to people who love it, then I’d suggest you stop by one of the Hodo Soy stands at the farmers markets (you can check where they are on their Web site). And if you want to take a tour of the West Oakland plant, check back at their Web site later this year for more information. This month's Single Guy Test Kitchen featuring the recipes from Food and Wine Magazine was a first. There was a tie in the poll to decide which recipe to test from the magazine's October edition: 40% voted for the White Bean Stew with Swiss Chard and another 40% voted for the Smoky Shrimp and Chorizo Soup. Of course, only a few voted for the dish that I really wanted to try, which was the Lamb Skewers with Salsa Verde because that recipe is from Chef Seamus Mullen, whose New York restaurant Boqueria Soho I love when I was there recently and who's currently a leading contender in "The Next Iron Chef." The recipe was from the section of the magazine that was dedicated to wine pairings. The soup was in the section about "old world wines" and how old world wines from Italy and Spain should be paired with food from the area as they've matured together. So they suggested you pair this Spanish soup with a red Rioja wine. Easy choice. It's been awhile I've made soup, so it was nice getting back into the soup groove. As usual, I cut the recipe in half because I'm the Single Guy and I don't need that much soup. Here's how the cooking went. You can get the full recipe from the Food and Wine Web site here. I started out shelling and deveining the medium-size shrimp that I got from my local grocer. I kept the shell and used it to make a stock according to the recipe. 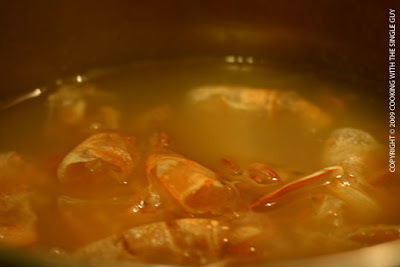 But it was a simple stock where I simply infuse the shrimp shell flavor into already made chicken stock for just 10 minutes. While my shrimp stock stewed at a low simmer, I prepped my other ingredients, including the other star, which was the chorizo. 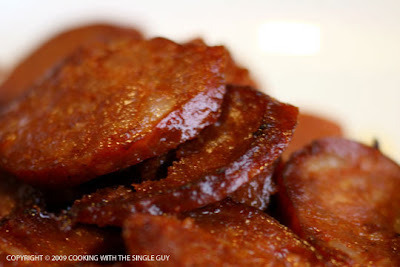 Be sure to buy the dry Spanish chorizo and not the Mexican version or fresh version, which can be too soft and mushy inside. 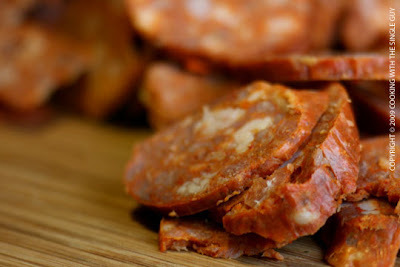 I get my Spanish chorizo from the nearby Piedmont Grocer on Piedmont Avenue in Oakland. You can also find them at the Spanish Table in Berkeley. This recipe had very basic ingredients. Along with the shrimp and chorizo, I just needed a sweet onion, one carrot, a clove of garlic and a can of diced tomatoes. Here's the chorizo after I've quickly browned it in a large soup pot. They look tasty to eat just like that, but I had to restrain and keep it to the side as I get working on the other ingredients. 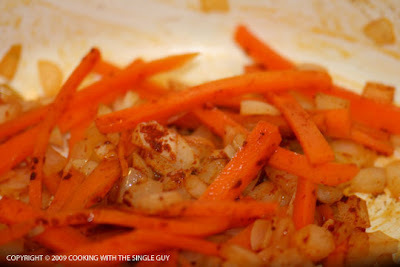 In the same pot, I started off sweating the vegetables, starting with the onion, garlic and carrots. That sprinkling of red you see is the teaspoon of smoked paprika or pimenton, which is a basic spice for a lot of Spanish dishes. I love it. It gives off a really nice smell as you're cooking your vegetables. After the vegetables softened, after about five minutes, I add the can of tomatoes and let everything cook for another five minutes until some of the liquid from the tomatoes evaporate. 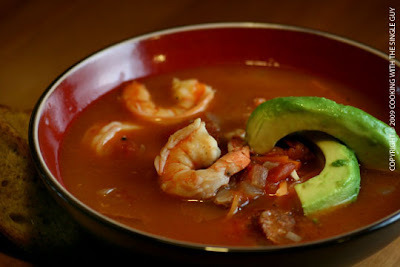 Then you start building your soup with the shrimp stock and chorizo, and finishing it off by throwing in the shrimp, which cooks really quickly. Then you add a tablespoon of flour to thicken your soup a bit, but I didn't have flour in my kitchen so I just used cornstarch, which is the Asian way to thicken soup. Same thing. And that was it. I garnished my soup with slices of avocados, which is suggested in the recipe, and then I was ready to eat. Here's my final bowl. How do you think it looks from the Food and Wine photo above? If you want to make this a hearty soup, especially for dinner or leftovers, add some cooked white rice. 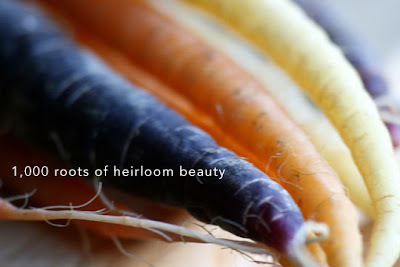 The recipe says to cut the carrot into thin matchsticks. But I felt it was weird eating soup with carrot sticks, so I would have liked to pureed the onions and carrots before adding the chorizo and shrimp, so the soup would be more smooth. But it's up to you want kind of texture you like when you're drinking your soup. Ease of cooking: This was another super simple soup recipe. Soup is always so easy to make. And it was quick, so I think anyone can do it. It makes a nice quick weeknight dinner. Taste: I really liked the flavor of the soup when everything was said and done. The slight smokiness from the pimenton was really overpowered more by the chorizo, which like any meat ingredient dominates the dish. But since I love chorizo, I didn't mind. Plus, the meatiness of the tomatoes was a nice support for the chorizo. 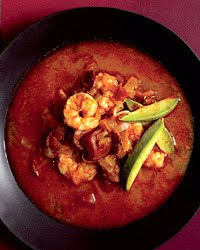 And there were a lot of shrimp in the soup, and I love shrimp, so again, it just had all the flavors that I love. Good job. Overall Grade: A for easy to find ingredients, simple steps and full body flavor. 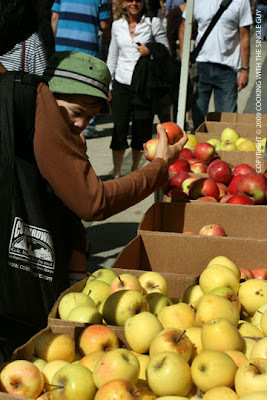 While I was at the Ferry Plaza Farmers’ Market last Saturday, I noticed that it was definitely apple season. 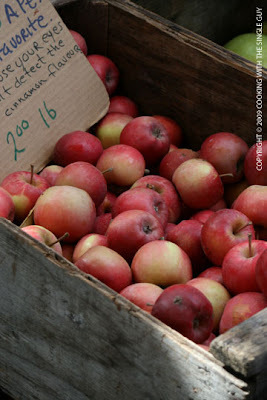 I spotted several stands with crates of apples, from luscious pink ladies to petite cinnamons to green grannies. I never really liked apples growing up in Hawaii because they were all shipped in from the Mainland and were often the huge, highly waxed Red Delicious. (Do you still eat those?) While an apple is a great carry-along snack because you can take it anywhere, I never really liked the chewy skin. 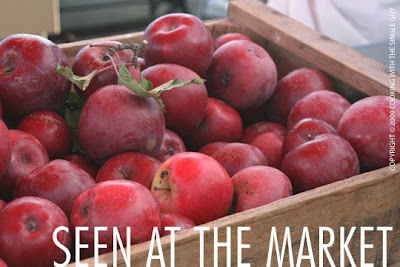 But now I can find all sorts of apples of different shapes and colors. One of my favorites from the stores is the macintosh variety (maybe because I’m a Mac guy) because of its crunchiness and sweet-tart flavor. I mostly just eat them as a snack or toss them in a salad. What do you like to do with apples? Emerson’s face may not be that recognizable by many people (even I took the picture and thought, hmmm, where have I seen him before?) 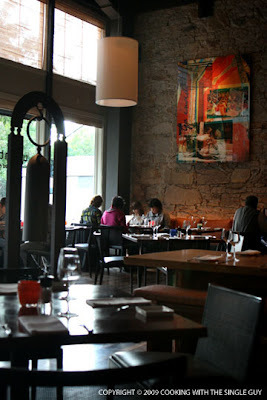 but his restaurant, Contigo, is one of the few hot spots in the city creating a lot of buzz right now. I haven’t been able to check it out yet, but I’m dying to try his take on Catalan-inspired dishes using fresh, seasonal ingredients. 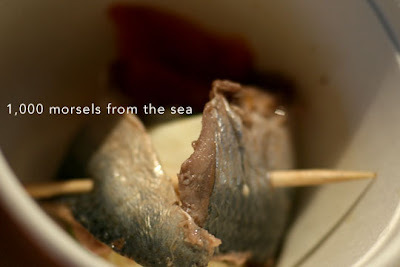 Emerson also pens the blog, In Praise of Sardines, which partly talked about his adventures in opening his restaurant. Not surprisingly, he hasn’t posted any new entries since Contigo opened in March. But from what I hear about the food, it sounds like it’s worth keeping him busy in the kitchen than in front of the computer. During the Columbus Day weekend, my older sister was visiting from Hawaii. She travels a lot for work and often complains about the heavy business dinners she finds herself eating on the road. 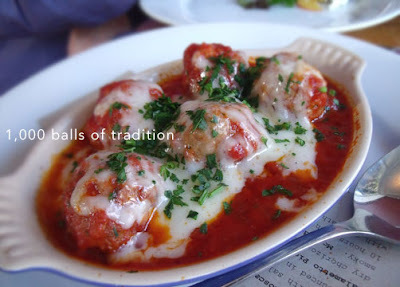 So when she suggested we spend the day in Napa Valley, I thought she might enjoy the lighter, vegetarian fare at the celebrated Ubuntu restaurant in downtown. 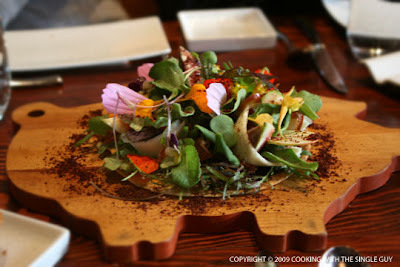 I was spellbound when I first visited Ubuntu for lunch last year. 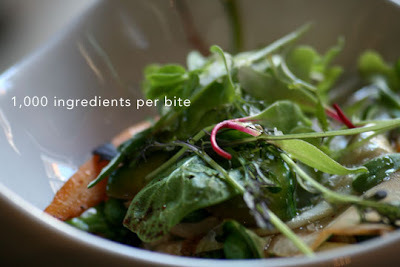 Chef Jeremy Fox’s magic with vegetables was showcased in beautifully plated dishes crisp in flavor and freshness. Since then, the restaurant and Chef Fox have received a multitude of national praise, and just this week received its very first Michelin star. 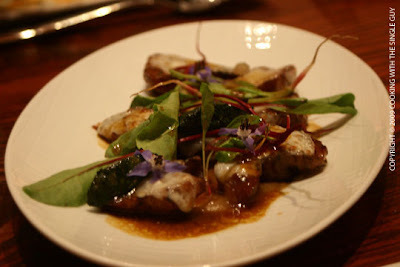 The menu changes regularly, although stays primarily the same throughout a season. Again, the mode was small plates shared around the table. I did notice that the dinner tasting menu was no longer offered, and the popular pizzas from lunch aren’t available at dinner (although our server says it may be added to dinner soon). Here’s what we ate. I should say that I wasn’t as good with my note-taking this time around, so I don’t have the precise name and prices for the dishes (most dishes were in the $9-$15 range). So I’m working off memory right now. First up was the house specialty Carta da Catalan, which was a flat bread topped with all the ingredients from the restaurant’s organic garden just up the street. It came on a pig-shaped wooden platter, which my nephew noted was probably the chef’s play on irony. All the ingredients blended beautifully together, rounded off with dehydrated beet bits that were supposed to represent dirt from the garden. Although simple and clean in flavor, it was a challenge to pick up and eat. The flat bread hidden under the huge pile of greens is almost paper-thin, so it was more like a cracker. 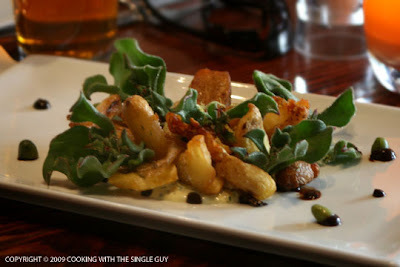 This is a dish of crispy potatoes, which you can’t go wrong for college students. It was mixed with a succulent plant, which I think was called “ice plant,” and sat on a puree. This was one of my favorite dishes for its unusual ingredients (the succulent, not the potatoes) and expert preparation. This is an example of how the dishes at Ubuntu seems to be shrinking. Although a wonderful display of fall colors, this puree of kohlrabi seemed lacking in substance and the tastes components didn't seem to be enticing. Although the crispy beans were popular with the college kids. 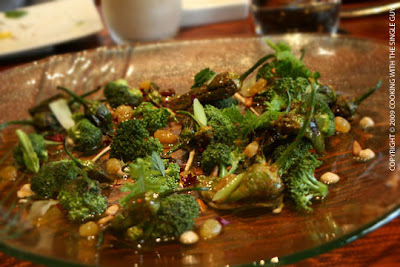 We got a double order of this dish, which was broccoli with padron peppers. When brought to our table, our server finished it off with a light sauce that was more a broth. Most of the college kids at the table weren’t turned on to the Spanish flavors of the roasted padron peppers, so I ended up eating most of it. While I liked the peppers, I don’t know if there was anything special in the preparation. I was hoping the pasta dish would be substantive like the pizza to satisfy the young appetites at the table. My sister ordered it with a fried egg on top just to give my nephew some added protein. 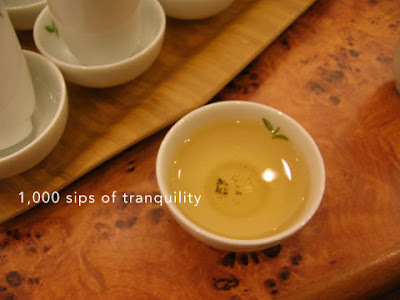 But when it arrived, it was beautiful but quite a small serving. We all got just a spoonful of taste. I forgot what kind of pasta it was, but they were small kernels almost like a grain and served with roasted tomatoes. 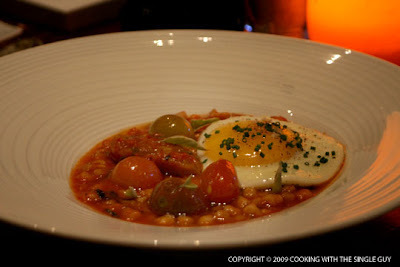 I enjoyed the flavors of the tomatoes and the egg did help, but it wasn’t that filling. This is the braised sunchokes, which again came out beautifully plated. But there was a tartness to the sunchokes that I didn’t enjoy, so this was the least popular dish of the night. 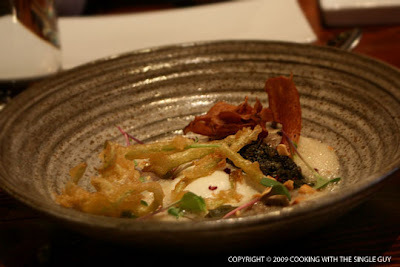 These dishes represented a bit more than half of the menu, and all the other items didn’t necessarily appeal to us. My sister, probably feeling a bit guilty about not feeding her son enough to eat, suggested we move on to dessert instead of eating more orders of what we already had. We ended up ordering almost every item on the dessert menu. Probably the most beautiful dessert was this apple, which I think was called a “Claudette.” (Again, sorry, I didn’t take notes.) 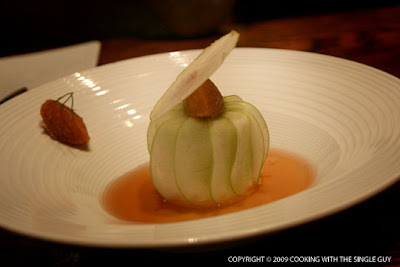 This was an ingenious dessert of thinly sliced green apples layered around a filling to recreate the shape of the apple. Inside were two types of filling; we all agreed that one of the filling was an apple sorbet. What was so interesting was the apple sorbet was hard like a crunchy apple, but melted when you ate it. This was my favorite dish of the night for the presentation, creativity and taste. Other desserts we had was the classic cheesecake in a jar (which I had last time). My nephew loves cheesecake so he got a kick out of the idea of eating it straight out of a jar. 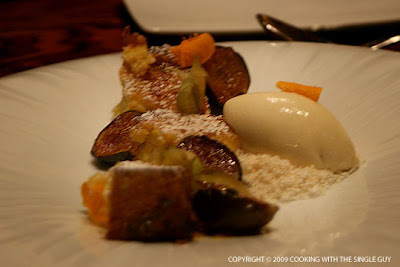 We also ordered the cornbread pain de perdu with figs. The dish looked rustic and pretty, but all the components didn’t seem to blend well together. 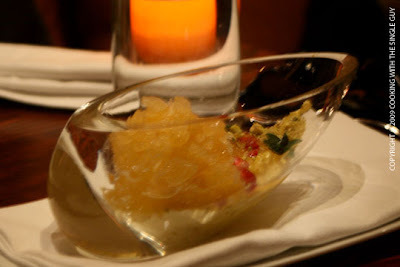 We also had the saffron rice pudding, which came in a clear glass boat. The pudding texture wasn’t as creamy as I liked but it was pretty. Overall, I felt the dishes were as creative as I remembered, but I did feel the portion sizes seemed smaller, which makes it hard IMHO to have a filling meal. One of my nephew’s friends did say he was impressed by the complexity of flavors in each dish, so I was glad that the experience opened his eyes to something new. The service was just as proficient and friendly as before. Although I found only a few things to be thrilled about in Fox’s current fall menu, I am still impressed by his creativity and details in presentation. But for a better value, it might be worth checking out Ubuntu for lunch when you can order the white pizza. Earlier this year, I finally shopped at La Farine French Bakery and fell in love with their fruit tartlets, among other things. 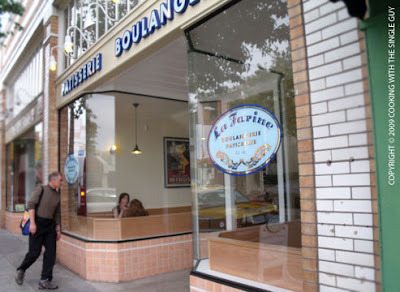 But the threat of carb overloaded was kept at bay because: 1) I’m lazy and 2) the original La Farine location on College Avenue on the edge of Oakland’s Rockridge neighborhood would require a very long walk or a bus ride to get to from my apartment. But curses! (I sound like a cartoon, huh?) 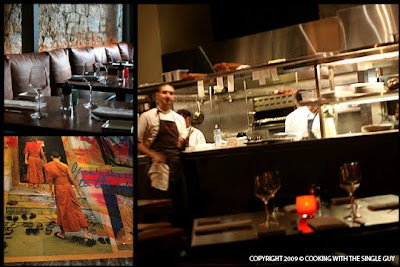 Now La Farine has opened a new location on Piedmont Avenue, which is just a 10-minute walk from my place. 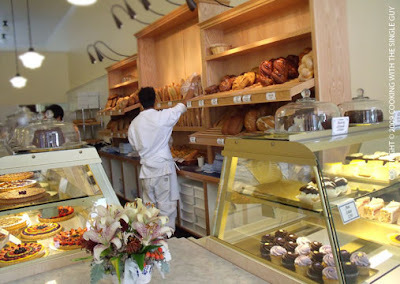 I will now be forever tested on how often I can avoid the buttery goodness of La Farine’s baked French breads and pastries. 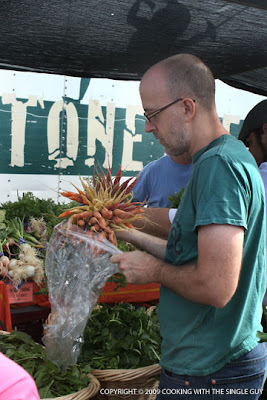 I couldn’t resist checking out the new location this past weekend when I was doing some grocery shopping. The store lacks some of the charm of the original location, but it definitely is roomier. There are several small tabletops along one side so you can sip on some coffee and munch on some pastries. I noticed some pretty purple frosting cupcakes in the counter and there were tons of fruit tarts for sale. I picked up a whole grain baguette and one of the last two fruit tartlets. What’s amazing about their tarts and tartlets are the colorful designs on top created by the carefully placed patterns of the fruit pieces. 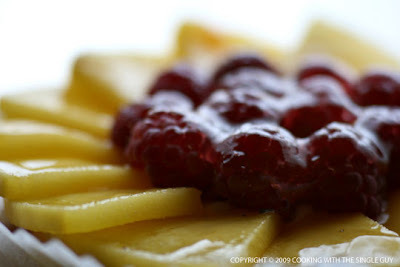 This one was a tartlet with some kind of yellow fruit thinly sliced and then made into a fan design. I couldn’t tell what it was but it reminded me of unripened mango, topped off with a few tiny raspberries. It was delicious! 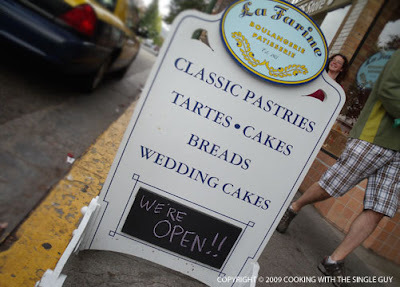 If you’re ever wondering where I am on a weekend afternoon, chances are high I’ll be munching on a fruit tartlet at La Farine’s Piedmont Avenue location. 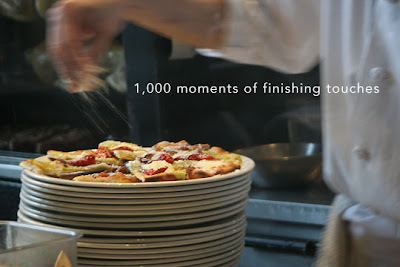 My 1,000th Post — But, really, who’s counting? Yes, I can’t believe it myself. 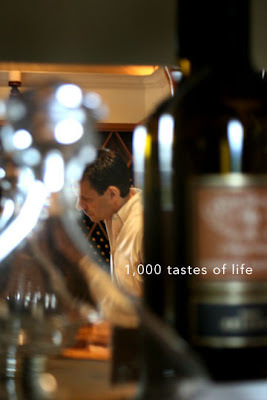 One thousand posts made up of more than 220 restaurant reviews, about 170 recipes, more than 132 trips to stores that I shared, nearly 80 recaps of “Top Chef” and “The Next Food Network Star,” and countless other interviews, video demos, cupcake love notes, and peeks into my frig. No wonder I’m always so tired. 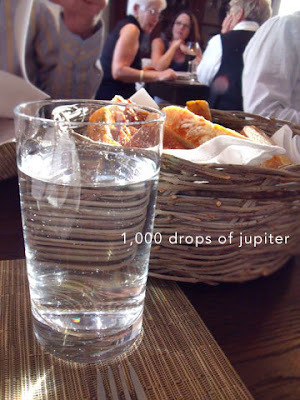 I tried to think of something significant to do for this 1,000th post. But I couldn’t come up with anything that grand to match the occasion. (You know, if I were a TV show I’d be in syndication.) So I decided, like usual, to just go with what’s on top of my head. Instead of just free-styling it, I decided to do it in one of my interview formats. So basically, I’m interviewing myself, which as a Single Guy isn’t that unusual since I’m constantly talking to myself. I just hope I can open up. The following are edited excerpts of my conversation. Single Guy: So can you believe it? 1,000 posts? Ben: No, I can’t. I guess it just means I really love writing for this blog. Or maybe I just don’t know how to self-edit. SG: Do you plan to keep up this pace? 1,000 posts in three years is kind of a lot. B: Awhile back, I thought maybe I should slow down. Because, really, coming up with posts, then processing the photos to go with them, do take up a lot of time. I’m practically working on my laptop every night as I’m watching TV. I post about three to four times a week, and I thought I should drop back to maybe two to three times a week. But then I always find something I really want to talk about, and then I start getting a backlog of post ideas, so then I just end up throwing them up on the blog. SG: People forget that you have a day job. And it’s not related to cooking. B: Yes, this is just a side thing for me. I work full time in corporate communications, but this blog has been my way to creatively express myself in ways I can’t really do at work. SG: What’s the best thing about having this blog? B: Oh, so much. For one, it’s really given me a purpose. Before I never knew what to do with my weekends, but now I think, “oh, I should go out and find something to blog about.” And it’s given me a reason to go out and try a new restaurant. I used to hate dining alone, but now I have a reason to because I’m going to blog about it. Second, it’s connected me to a community. Through my blog I’ve met people who also love food, and I’ve heard from readers or people who post comments, and that interaction is something that makes me feel like I’m part of something. SG: What’s the worst thing about having the blog? B: It would have to be the haters. I give people credit for being passionate about their beliefs and their opinions, but I’m a sensitive guy [awww] so I really do take the comments I read personally. So on the few occasions, and luckily it’s only been just a few times, when some anonymous person dumps on me or gives me some snarky, back-handed insult, it’s depressing. It makes me kind of sad knowing a stranger feels comfortable putting down someone they totally don't know. There were a few times when I felt like I wanted to stop blogging because a comment made me so upset. I’m all for free speech, which is why I don’t require approval before a comment gets posted, but I think there’s a difference between expressing an opinion and just attacking someone. Readers don’t always see the full onslaught because I delete the really hateful comments. But since I have to read it first in order to decide to delete it or not, then it sticks with me, you know? SG: So comments get to you? B: Actually, I love comments. And I wish there were more comments on my posts because it makes me realize people are interested in what I posts. It’s my way to gauge what kind of posts you like reading. It’s just the hateful anonymous posts that I don’t like. In reality, a lot of the really hateful comments are to my cooking demos that I post on YouTube. I spend so much time blocking users on that site. I do want to take this time, though, to give a shout out to my readers who consistently post comments, people like Foodhoe, Food Gal, Hungry Dog, Mrs. L, and Cookie. It really means a lot to me that you take the time to share your thoughts, even if it’s just a thumbs up because it lets me know that you like what you read. When I first started, I had no comments, and then this guy Seth started posting (and my friend, David, too but I told him to post). I realize readers come and go, and I haven’t seen a post from Seth for a long time. But if he’s still out there, I want to give him a hug for being one of my first commenters! SG: Back to the point about YouTube, why do you post there if you get such hateful comments? B: I treat it like a hosting server for my videos. Now that Blogger allows you to upload videos, I’ve thought of just doing it here on my blog. But even with all the negative people on YouTube, there’s also been a lot of new viewers who enjoy my videos and probably wouldn’t discover my blog if it weren’t for my YouTube channel. I have about 30 videos up and so far they’ve been viewed a total 208,000 times. SG: That’s a lot. Which video is the most popular? B: At first I thought it was the one where I made the spam musubi (more than 40,000 views) but when I last checked it was the one where I killed a live crab (58,500 views). SG: So your blog is called “Cooking With The Single Guy,” but you haven’t actually been cooking that often lately. Or at least you haven’t been posting recipes. 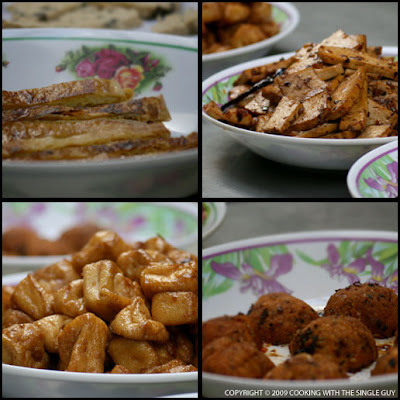 B: When I started the blog, I figured I’d post a recipe a week. And my thing was posting simple recipes that single people who are cooking for themselves could easily make, especially after coming home from work. But after the first year, I went through my repertoire of recipes that I rely on as a single guy. I still cook a lot for myself, but it’s just I’m cooking the same recipes I’ve already posted. I’m hoping in the future to get back to posting more recipes. What I’m doing is thinking of past things I ate growing up and putting my own spin on them, or being inspired by ingredients I find or dishes I eat at restaurants. But yeah, I’m definitely going to get back in the test kitchen. SG: What are your standbys that you’re always making? B: When I don’t know what I feel like eating, I know I can always make paella and that gets me happy. 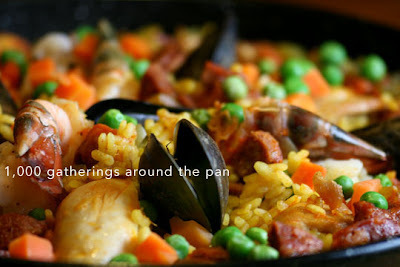 There’s something about the paella rice that’s so hearty and comforting to me, and I love the flavors. You can just create your own paella by throwing whatever you have in the frig and then adding maybe chorizo or pimenton. So I make that often. When I come home from work, I eat salmon often and would either steam it with black bean sauce or glaze it. Other dishes I make often are mapo tofu, spaghetti and meatball, or a stir-fry. When it’s in season, I love making my peaches and pork stir fry and sometimes if I remember I’ll make my sticky chicken. I have to make a point to make that dish because you have to marinade the chicken pieces ahead of time. SG: People think you eat pretty healthy because you’re always writing about how you don’t eat deep-fried foods or fatty dishes like foie gras. But I know you’re not perfect. So what are some of your food vices? SG: What’s the question people seem to always ask you? B: People always ask me about the name of my blog and what I’m going to do when I’m not single any more, whether I’ll change the title. I tell them that I don’t know because I don’t know if people will find me if I changed my URL or name, plus now I’ve built up some equity being the Single Guy. SG: Um, I’m the Single Guy. B: You know what I mean. SG: So why are you still single? B: That’s kind of personal, don’t you think? SG: I think people want to know. I mean, you’re getting older and you’re still single. What’s the deal? I would think you’d find someone, especially since you like to cook, and they say the path to someone’s heart is through the stomach. B: Is this leading anywhere? SG: Yes, why aren’t you dating? B: I don’t really like this line of questioning. SG: Do you have something to hide? B: I don’t think it’s any of your business. In fact, I think we’re done. This interview is OVER. So this is the point where I couldn’t get myself to continue the interview, and boy, was it quiet around my apartment when I wasn’t talking to myself for three days! But eventually I came around and while I never really finish the interview, I am open to answering any of your questions. So if you have any additional questions you want to ask, just post a comment. I’ll be happy to answer them, except the one about why I’m not dating! And thanks everyone for visiting my blog and coming back regularly. 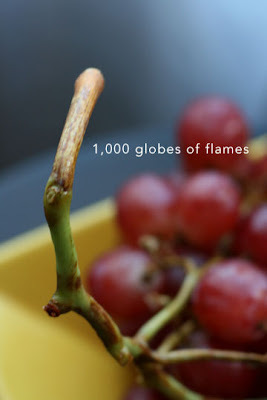 I hope you enjoy reading my next 1,000 posts!